I've been playing with an EEE PC lately. This 299€ (in Portugal) GNU/Linux ASUS laptop is awsome, and I'm really happy that ASUS did it. They did some mistakes, like using Xandros Server 2.0 as base for their distro, making me think, for instance, that if I had one of these I would replace their Operating System with something like Debian Eee PC, eeexubuntu or even eeedora. I might write about my thoughts on EEE PC later, but for now, a quick HOWTO (because I think this isn't documented nowhere) on installing Second Life on EEE PC. Your Second Life is now installed. To run it write slviewer in a terminal. Regarding to using Second Life itself, you'll notice that the windowed view assumes a bigger resolution than the one you have, so I recommend you to start by going to the options, changing the ratio scale and remove the windowed mode. Et voilá, you're on Second Life! Can you please put here aptitude's output? Thanks for the reply I have subsequently tried downloading the linux version of SL directly from the website extracting and running from a console. This works to the extent that it starts and doesn't seem to have fubarred anything else but dies about halfway through start up due to a window making error as a result of the a glx visual error ( I have tried resetting colour depth to both 24 and 32 but to no avail). I am begining to think it is a hardware compatibility issue with later eeepc (which is a bit disappointing) though I have seen posts on the wiki which suggest it will run on the eeepc 900 under other linux os. I realise that makes the solution seem simple switch the os but actually it makes me think more that there must be a work around (I like the user friendly xandros interface:) Thanks for sharing your insights Noori I will post back if I find a solution. Just thought I would check back SL does indeed work well on the 900 in mandriva the downside is a lot of users also experience problems with the built in mic and intermittant issues mounting harddrives. Hi, i'd tryed to use this Howto into my Eeepc 701, but not work. i'd investigate with synaptic and there isn't public PGP key for that repository. The package nowadays have a broken dependency. Hi, well I got SL running on my 701 with no difficulties, it was an early one and I did not (need to) alter the xconfig file. Since then several colleagues with later models of 701 (and 900) did have difficulty. I've recently upgraded to a 901, which has several hardware changes over the 701, and I was disturbed that I too could no longer get SL working (the blessed windows creation error) but on looking what was appearing in the console it was clear it was a colour depth problem. The change to xconfig has now enabled me to run SL. Many thanks! i'm using 900 and after the x mod to 24 currently having a window problem, it's ok when in a window, well at 2 or 3 fps anyway, it crashes out when going to fullscreen. it seems to be because of the resoluttion being nonstandard 1024x600. is this problem from programs detect resolution by scanlines (which should be redundant with lcd and tft)? i can't get it to work using a vga crt either but that's probably because of the limited multi desktop manager that can't even remember i set it to 1024x768 not 800x600 in the firstplace. just basicly adding that yes it works, no it's never easy. let's keep trying! 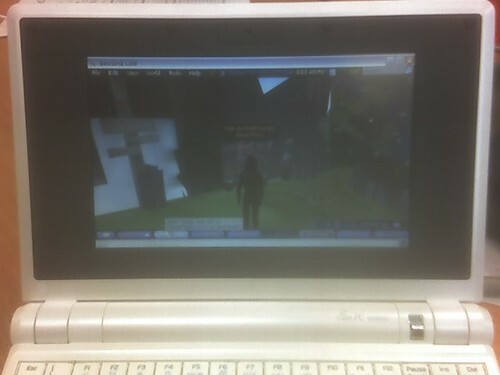 I have Eee PC 901. Installation under Xandros was easy but I must work for the stability. Do you have good tips? Diddle: I never tried it on an 900, and never found those issues before. Question for both: are you using the 1.21.6-1 version? No, the package number seems to be i686-1.21.6.99587 . I got it from SL site. Maybe that is the big difference? I guess talkerspt.no-ip.org is temporarily down. Few seconds after I said that, now downloading works. You see that I am a Linux newbie. This is difficult, and I am not sure what I'm doing wrong. I'm trying installation but I get plenty of error messages. * Your Second Life is now installed. To run it write omvviewer in a terminal. Please tell me if this work well for you. If it doesn't, feel free to post here the error messages you get, and I'll try to help you... But with this latest "howto" you should have no problems at all. Thanks! I must try that. Sorry for the late reply. A new version is out (do the same thing I told you to in my previous comment), can you please try it and see if the problem is gone? I downloaded on my eeepc901 linux debian xandros (desktop) and just ran it . But it lagged a lot. Document standards: there can be only one?